The Asian Vegetable Trial was conducted in the summer of 2008 at the Nine Palms Ranch project. 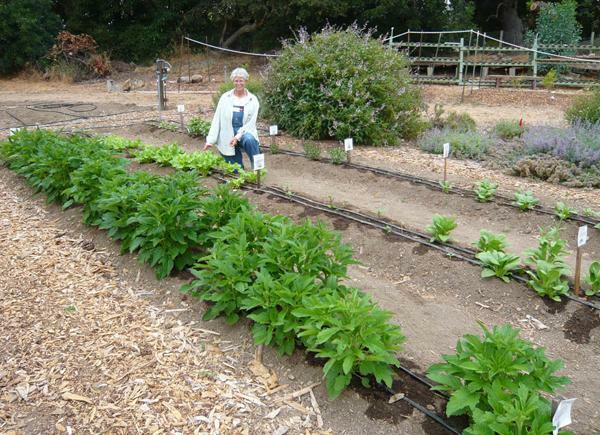 Five varieties of bok choy, three varieties of eggplants, and three kinds of sesame seeds were grown. All varieties were successful. Particular favorites were Fun Jen bok choy and Thai Roleks eggplant. This project was undertaken to compare five varieties of bok choy, three varieties of eggplants (from three Asian food cultures: Chinese, Japanese and Thai), and three kinds of sesame seeds. This data may be helpful to Asian residents as well as non-Asian residents interested in growing selected Asian vegetables. A 2" layer of horse manure and a scattering of alfalfa pellets and bone meal was rototilled into the 12' X 31' plot. We raked it into three 2' beds with a 3' path between them. The seeds were started on April 22. The bok choy were transplanted on May 20 and the sesame plants on June 24 when they were about 6-8" tall. The eggplant seedlings were eaten while in the shade house, so they were reseeded and eventually planted on July 11 when seedlings reached 3-4" tall. The automatic irrigation watered three times a week for 40 minutes plus was run for an additional 40 minutes on Tuesday and Friday workdays. The irrigation timer was discovered to not be working on July 28. The soil had gotten very dry. The plot was hand watered until the timer was repaired on August 5. 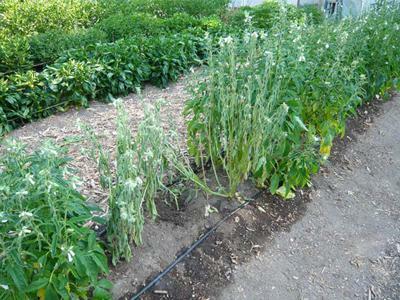 But this dry spell caused problems with the sesame plants. No additional fertilizer was used. No pesticides were used. The first bok choy were harvested beginning one month after planting. The plants were large, lush, and beautiful. By June 17 all bok choy were flowering except Mei Qing. A second planting in June produced smaller plants. The second harvest was complete by the end of July. 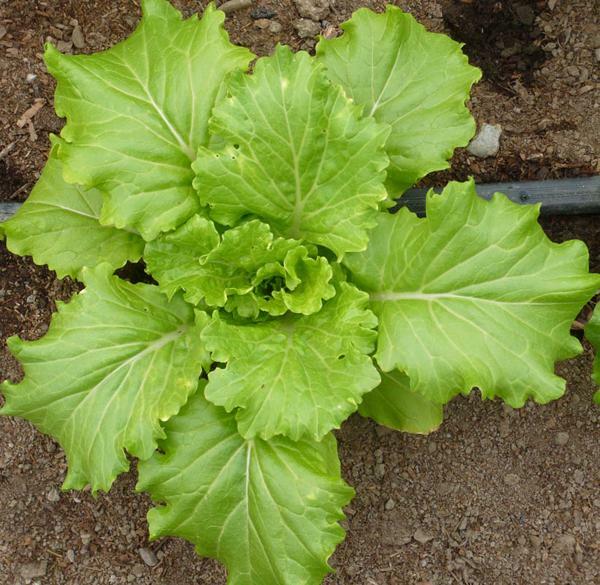 The bok choy of particular delight for its color, size and frilly appearance was ‘Fun Jen’, a bok choy from Taiwan. All varieties will be grown again during the winter season for growth comparisons. Japanese Millionaire Late May July 11 First to harvest. The most productive at the research gardens. Thai Roleks Late May July 11 Beautiful, sweet, green. My favorite. The most productive at my home garden. We began harvesting Millionaire (Japanese) on Sept 2. 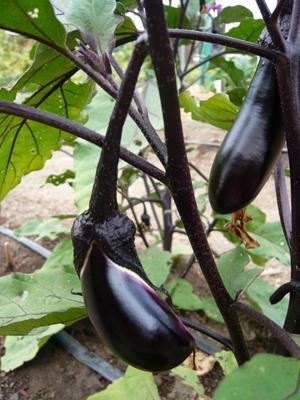 We continued to harvest from all of the eggplants until the plants were removed on Oct 20. Three varieties were planted: black, tan, and white. After a beautiful flourishing start they began to show signs of distress around Aug 15, the literal downfall probably due to a period of days without watering due to an irrigation timer malfunction. Most of the white sesame plants’ lush foliage dried up and plants fell over. 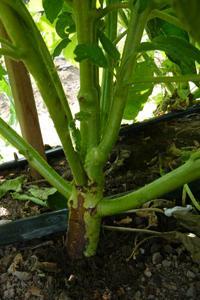 Visible browning at the base of the stem occurred initially. Several weeks later the remaining plants were attacked by aphids. Irrigation lines were relocated away from the base of the plants on the theory that too much water directly at the base of the plant was causing fungal damage. Plants were overhead sprayed for aphids which successfully eliminated the problem. A week later the irrigation lines were moved a bit closer to the plants and all proceeded to grow in a healthy manner. Analysis from the state agricultural office did not yield any results. Harvesting sesame seeds is quite time-consuming but the results, when toasted, are quite tasty and worth the effort. 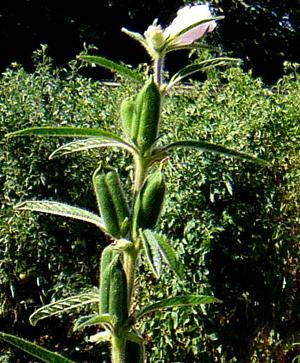 As seed pods mature from the bottom of the stem upwards, the pods break open. Seeds do not seem to burst out and fall to the ground immediately but slowly work their way out of the pod as it opens wider. A close watch on pod maturity will result in plentiful seeds. 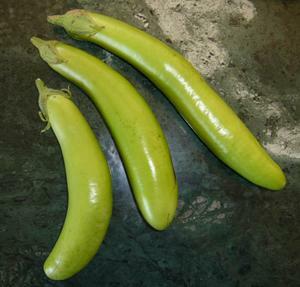 Stems were cut when one-half to two-thirds of the pods were opening. Stems were turned over into a big white bucket to catch seeds. The stems remained in the bucket for several days as drying and shattering continued. In the end, each pod was opened and cleaned out to retrieve maximum seeds. 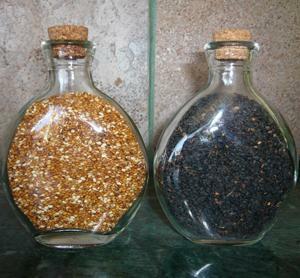 Seeds were toasted over low heat for about 10 minutes, cooled, then stored in jars. All seeds were ordered from Kitazawa through Yamagami's Nursery. All of the varieties of bok choy, eggplant, and sesame seeds were well worth planting. Particular favorites were Fun Jen bok choy and Thai Roleks eggplant.